The Downs Veterinary Practice is an RCVS accredited small animal practice boasting state of the art equipment and facilities. We offer convenient and friendly veterinary care for local pet owners and also provide a veterinary referral service for practices across the South West. From left to right: On-site MRI Scanner. Fully equipped operating Theatre. Twenty-four hour care for patients. Damien founded the Downs Veterinary Practice in 2003. 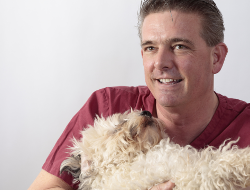 He has since taken a varied surgical referral caseload from vets across the Southwest. His main interests include non-routine spinal disease and reconstructive surgery. He became a RCVS Recognised Advanced Practitioner in Small Animal Surgery in 2015. Outside of work, Damien enjoys cricket with his two sons, mountain-biking and winter sports. Jenny graduated from Bristol University in 2012 and joined the Downs Veterinary Practice the following year. She has completed a three year period of study for the BSAVA Post Graduate Certificate in Small Animal Medicine which she gained recently, with a distinction. Jenny is in the process of applying for RCVS Recognised Advanced Practitioner status. Jenny has a keen interest in all areas of feline and canine internal medicine to complement the existing surgical referral service. The Downs Veterinary Practice Limited is registered in England, number 05412181, at Oake House, Wellington, TA21 9LR. For more information, please refer to the details of our referral practice for vets or see our contact details, including out of hours service.